I wrote yesterday of what a big fan I was of the Justice League. Well, my favorite stories were always the yearly guest appearances by the original super-team, The Justice Society. I was fascinated by this group of characters and would try and hunt down any appearances they would make. I was thrilled when they finally got their own series by Len Straczewski and Mike Parobeck, but disappointed that it lasted under a year. They finally came back again in a big way under the pen of Geoff Johns, and I have enjoyed their new adventures quite a bit for the most part. Now that the DCU is about to undergo a huge revamp, I wonder what the future will hold for them. Perhaps their own dedicated Earth-2 is in order again? I like the JSA so much, that I couldn't just stick with one cover... more to come tomorrow! So, on this cover, we have sand, a green lantern, a liberty belle, some steel, a wildcat, a flash, a cyclone, and then it is... enter the THING? Sheesh. Couldn't they get some PEOPLE? That's funny right there I don't care WHO ya are! I can't tell you how much I really enjoyed Parobeck's Justice Society! It truly is a sorrier world without Mike Parobeck in it. 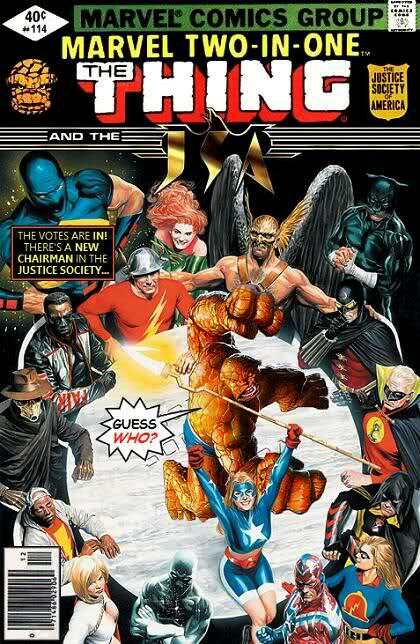 I think I enjoyed the brief run that James Robinson and David Goyer did with Jack Knight as part of the JSA. I think that was up to The Return of Hawkman. I've been meaning to track down Geoff Johns run that followed, I've heard great things. There's just something about Johnny Sorrow that was cool. That is one really fantastic cover, right there, let me tell ya!